"It will pass," the teacher said. "It will pass," the teacher replied. A dervish arrives a village after a long and tiring travel. He asks if there is someone who can accommodate him; someone to give him food and a place to sleep. Villagers say that they are also poor people and their houses are small. And they tell him to go to the farm of someone called Şakir. Dervish walks to the farm. On the way to the farm, he encounters a few villagers who mention about Şakir. He learns that Şakir is maybe the richest person in these lands, and the second richest is another farm owner called Haddad. When Dervish reaches the farm of Şakir, he is welcomed and treated well. Both Şakir and his family have good hospitality, and they are generous people. When the time to leave comes, Dervish tells Şakir, "You should be thankful to the Creator for this wealth." Şakir replies: "Nothing stays as it is. Sometimes what you see is not the reality. This, too, shall pass." After leaving the farm, Dervish ponders on these words. A few years later, Dervish comes to that place again. He remembers Şakir, and decides to visit him. When he asks about Şakir to the villagers, they reply, "He got really poor, now works for Haddad." Dervish goes to the farm of Haddad and finds Şakir. Şakir now wears old clothes and he looks much older. Because of a flood three years ago, the farm of Şakir was ruined, so he came to serve Haddad. Şakir now hosts him in his humble house and shares his little food with Dervish. Before he bids farewell, Dervish tells Şakir about how upset he has become over what happened to Şakir. Şakir says, "Don't be upset. Remember, this, too, shall pass." Seven years later, Dervish again comes to the same place. 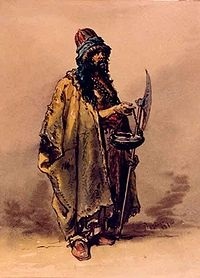 Then he learns that Haddad died a few years ago and left all his property to his loyal servant and best friend Şakir. Şakir now owns huge lands and many cattle, and is the richest person in the region again. When Dervish sees Şakir, he tells how happy he is to see his friend well. Şakir again says, "This, too, shall pass." After a while, Dervish looks for Şakir again, and they show him a hill. Şakir's grave is on that hill. And on his grave stone, it is written, "This, too, shall pass." Dervish thinks to himself, "What is about death that will pass?" and leaves. Next year, he comes back to visit Şakir's grave but he sees that there is neither a hill nor a grave left because of a flood; no trace left after Şakir now.